Hey, I'm trying to run the Azure sdk for .NET (VS 2015) v3 webplatform install and it is failing on the Service Tools. "This product cannot be installed because a product that it depends on did not install successfully"
The following repeats at steps in the log as well and seems to be the most descriptive line. 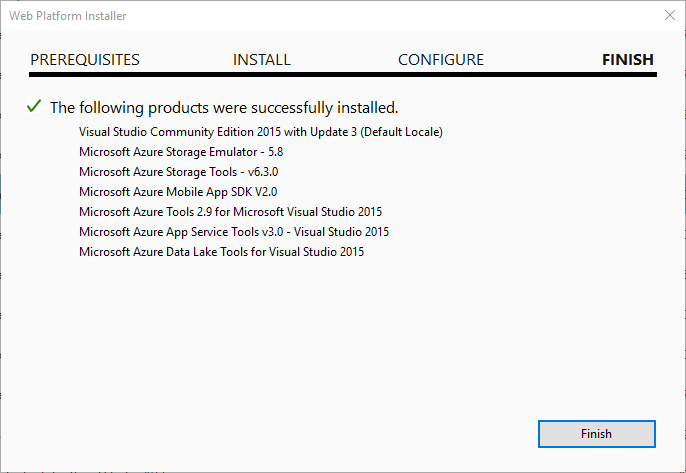 DownloadManager Information: 0 : Product Microsoft Azure App Service Tools v3.0 - Visual Studio 2015 had a dependency fail. Thanks for your help, I've looked around but nothing has worked. this is based off of a recent clean install. According to your description, I tried to install Visual Studio Community 2015 with Microsoft Azure SDK-3.0.1 on windows 2010 OS.It doesn't show any error. Could you please tell me more details about the VS version?